Let me be honest, we did not truly explore the Sea of Cortez. We sailed across it. That is what this post is about; nonetheless, I couldn’t resist the urge to title this post in tribute to Steinbeck’s famous book, which I started reading during our passage. Are you a little bit proud of me, Wilson? 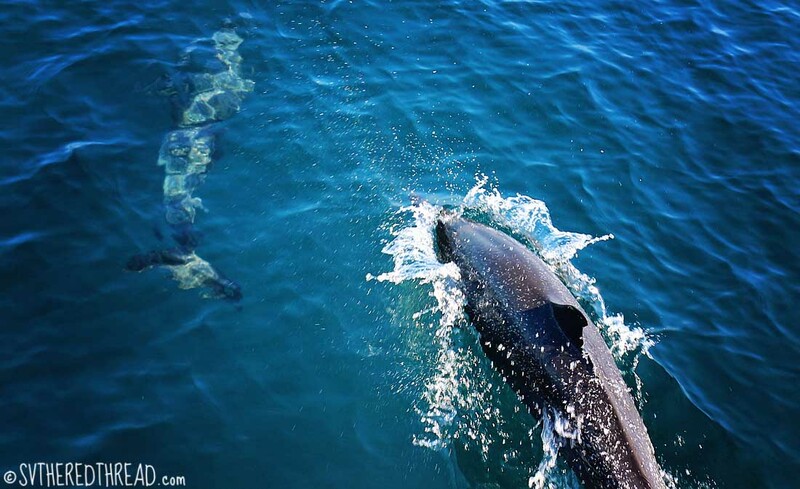 The Sea of Cortez is praised as being one of the most epic cruising grounds in North America, perhaps even the world. It is not uncommon to hear tales of sailors whose dreams of circumnavigating the globe faded after they found their way into the Sea of Cortez. Within the warm embrace of secluded desert anchorages whose days end beneath vibrant sunsets (and sundowners), cruisers dreams and boats grow rusty as their contentment in the region blossoms. 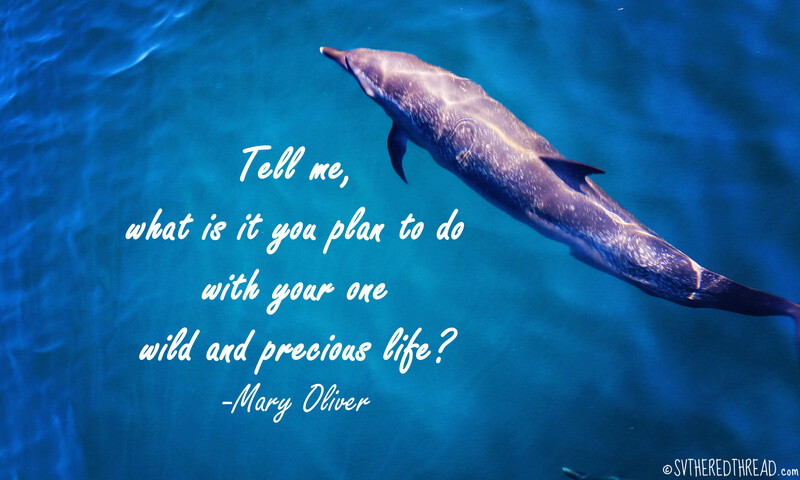 Risk of losing our hearts to the Sea of Cortez was not a problem we would encounter. A later-than-anticipated passage down Baja, unfavorable winter wind patterns, and Neil’s mom’s impending arrival in Mazatlán meant that we would sail across the Sea but would not explore its several hundred islands and anchorages during our South Pacific Stitch. The Sea of Cortez stretches some 700 miles, protected by the Baja peninsula to the west and mainland Mexico to the east. Unsettled weather is not uncommon in the southerly portions of “the Sea” (as it is known locally) particularly in winter when northerly winds blow south unrestricted over considerable fetch, yielding large waves. At the southerly point, where we were to make our crossing (23° north), we would also be contending with ocean swell that curves around the southern tip of Baja, where the Pacific and the Sea merge. We waited for a decent weather window and departed Cabo San Lucas at 1:30 am on December 22nd, with the hopes for good winds, seas that weren’t too uncomfortable, and a daytime arrival in Mazatlán some 200 miles east. For the first time in our 2,000-mile voyage, we sailed to weather, close-reaching on a port tack. For those among our readers unfamiliar with sailor-speak, this means that we were sailing more tightly into the wind with breeze on our front quarter, rather than cruising with it over our aft as we had been doing as we sailed south along the western coast of the United States and the Baja peninsula. This point of sail causes the boat to heel more and is generally less comfortable than downwind sailing. We made good time in 20 knots of wind for the better part of the first night. The Pacific swells were mild (roughly 4 feet) and were overpowered by the 6- to 8-foot wind waves that raced down the Sea. Thankfully, rather than tolerating the sensation of clinging to a miniature raft bobbling round n’ round in a washing machine, which is sometimes the case, the ride felt like a race atop a fierce, galloping stallion. It wasn’t smooth, but we carried ample sail, giving strength and determination to The Red Thread’s stride. Between watches, we didn’t sleep comfortably, but we weren’t miserable either. Winds remained in the teens for the next 24 hours. Daylight came on the second day of the passage and as the sun crept higher in the sky, the winds subsided. The balmy heat of the tropics basted on our skin with sweat, leaving us feeling sticky and sun-kissed well before noon. We couldn’t yet see land, but at last life emerged from the Sea. A pod of pantropical spotted dolphins raced in our bow wake to our cheers of delight! Neil was sleeping when I spotted a panga speeding toward us under the beating sun. Unsure why they might be approaching, I hollered for Neil to join me in the cockpit. A rusted boat came along side us. Three weary males crewed the boat, one of whom was just a boy. They raised an empty milk container and asked hopefully, “Agua?” Stories of fishermen with ill intentions had initially crossed my mind when I saw the boat heading in our direction. I awoke Neil because I felt nervous. I believe that the vast majority of people are good and without desire or intention to harm others. I scolded myself for not assuming first and foremost that the fishermen were seeking us with a benign purpose. Potable water, which we are capable of making ourselves [and were making at that very moment] was all they needed. A sea turtle lay dead in the basin of the vessel, and they opened a cubby to reveal a number of sizable fish, including a large bill fish, likely a black marlin. Who knows how many days they had been engaged in the laborious task of catching those fish. Had they succeeded in catching a bounty sufficient to continue to sustain themselves and their families? We filled their gallon jug and tossed it back to them, along with two Snickers bars. They tore them open immediately. We pulled into the swirling currents of Estero Sábalo just after two o’clock that afternoon. 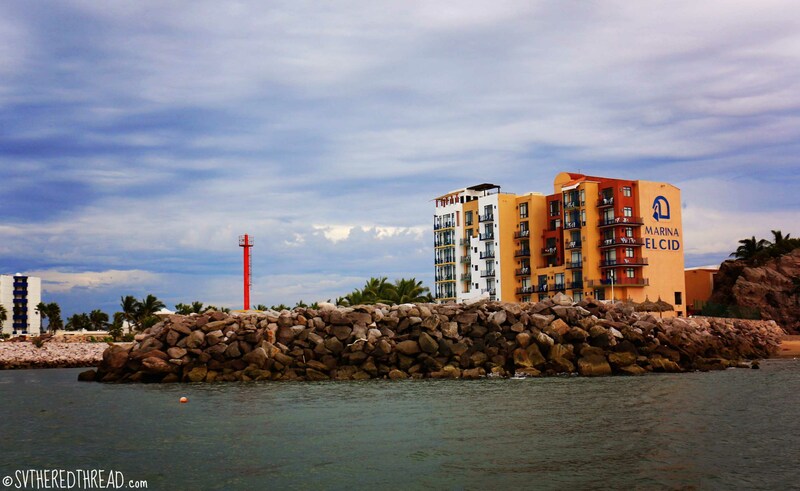 Located in the Zona Dorada region of Mazatlán, the channel leads to a series of marinas. We had made reservations at Marina El Cid, a large resort and marina. For just $1 USD per foot, we were given access to all of the resort facilities, including pools and hot tubs, restaurants, and showers with unlimited water. Hot water. Dreamy. A caveat about this luxurious stop. While we recommend the marina, we urge cruisers to pay in cash. Unauthorized charges were made on our credit card during our stay there, which we strongly suspect were the result of a copy of our credit card being stored in an unlocked filing cabinet. Figuring out how to have a replacement card shipped to Mexico is a real fiasco when you’re constantly on the move. Pay in cash. Also, be forewarned that you will likely be charged a minimum daily fee for electricity, about which you may not be informed upfront. It was 80 degrees on Christmas Eve. We rushed around maniacally, stringing lights along the lifelines; decorating our small tree; and hanging tinsel, stockings; and other holiday décor in our salon. 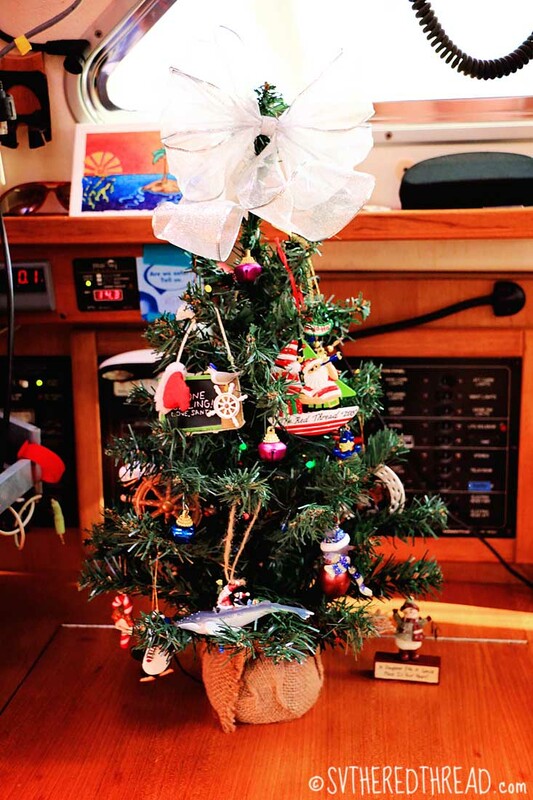 We were thrilled that Neil’s mom was flying in for Christmas, and we wanted our boat to feel festive when she arrived! After much ado, we hopped a taxi and hurried to the aeropuerto…! Jessie’s musings: The highlight of this passage was the moment the three fishermen closed in on us aboard a panga some 20 miles from shore. I was surprised by my nervousness about their intentions, and my unnecessary concerns were squashed immediately when they asked modestly for drinking water. To be surrounded by an ocean of water and without a drop to drink is a feeling I cannot fathom. I was humbled and reminded to keep my assumptions about others in check. 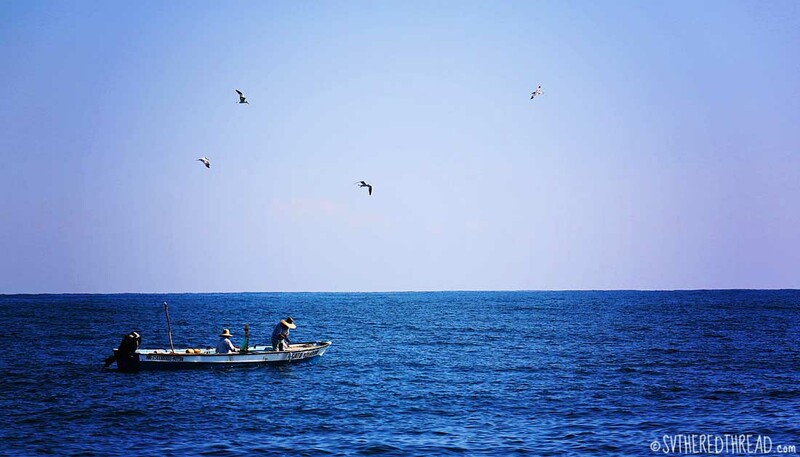 Neil’s reflections: Prepping to cross the Sea of Cortez is no small thing. Without restraint we heard horror stories of the “fetch” of waves that would build and stack to double digit sizes in very short sets, creating boat breaking conditions. Ultimately we had a very benign crossing, and though we sailed to weather, we couldn’t ask for much better conditions – maybe a little more wind on the eastern third of the sea, but no complaints! The mainland coast of Mexico is beautiful, with tall mountains and lush greenery as a backdrop to the cityscape. 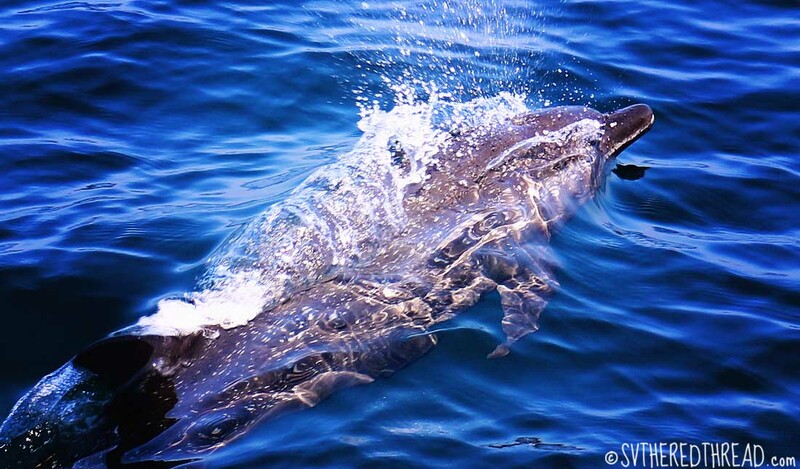 This entry was posted in By Jessie, Holidays, Mexico, Passages, Sea life, South Pacific Stitch and tagged El Cid Marina, Pangas, Pantropical spotted dolphins, Sea of Cortez, Steinbeck. Bookmark the permalink. First of all, you make me feel like I’m sailing with you, reading your description of each passage! You’re such a wonderful writer, Jesse! Second, do NOT feel badly about assuming I’ll intentions; much better to be safe than a victim of ill intentions. I’d personally rather feel chagrined than be dead! I hope you had a beautiful Christmas and are continuing to enjoy your great adventure! Sorry to hear about your credit card experience at El Cid. We had the same thing happen to us at a hotel in Ensenada when we were there waiting for Cambria to arrive on Dockwise. A $900 charge to a fabricated company was made the minute we checked out. And you’re right, it’s a huge inconvenience. Just had a thought, having replaced our credit card yesterday. What about having half a dozen different credit cards. Use one only and save the others in reserve. If you get unauthorized charges on the first, get the chages and card cancelled then put the second unused credit card into use. Just a thought.